When do you get rid of breeches? Every time another horse blogger posts photos of their beautiful breeches collection, I admit to a pang of jealousy. I can’t remember the last time I bought new breeches. I have 5 pairs that I have been stretching and stretching for at least 5 years now. 3 of them fit poorly, 1 of them I disliked almost immediately after buying, and that one remaining pair? Well, I love them. But I think they are done. They’re On Course Cotton Naturals, and they are the most comfortable breeches I’ve ever worn. Ever. I love them. I would buy them again in a heartbeat, or at least I would if I could justify spending money on myself when Tristan is flinging new bills at me left, right, and center. I can’t throw them away, though. In fact, I rode in them on Sunday for our trail ride. I love them that much. I think it’s time, though. Here’s what they look like now. Yeah. I know. And you also can’t see the hole over the right knee patch. 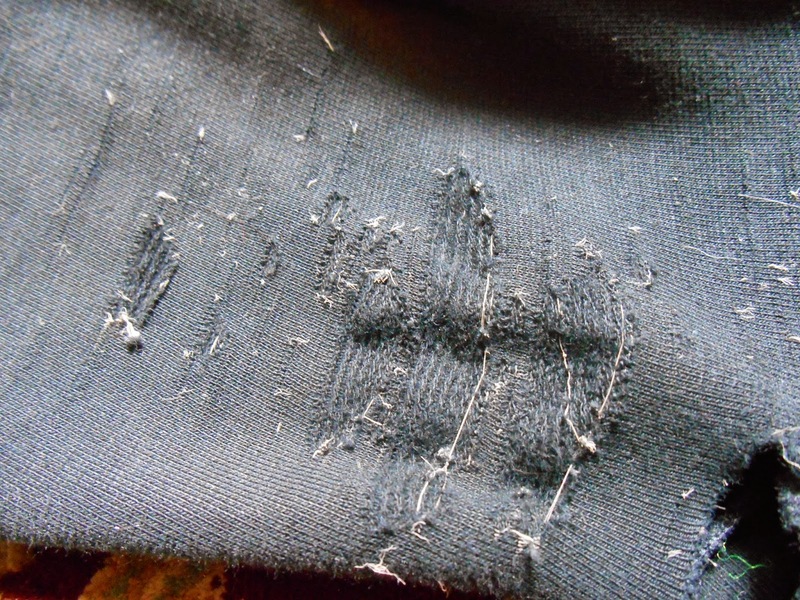 Here’s a close up of the wear pattern on the inside of the thighs. The elastic is just shot, and it gets exponentially worse whenever I wear them. And yes, that is a huge hole you see in the crotch. I’m finally tossing them today, but I am very sad that I’m now relegated to not liking a single pair of the breeches I own. How long do you wear your breeches for? Are you just as bad as me? I don't wear breeches (yay western!) but my favorite pair of jeans that I use mostly for riding are literally pretty much the same way. I think I'm going to try patching them because I'll cry if I have to toss them. I've worn On Course Cotton Naturals and like them very much. I also wear breeches to the very end – it gets to the point where they are so worn that I really should not be out in public, even on a horse! When I was younger I wore Kerrits to the death. I mean I still had multiple pairs of them nearly 15 years later though I stopped wearing them in college. From there I picked up used Tailored Sportsman and lived in them. 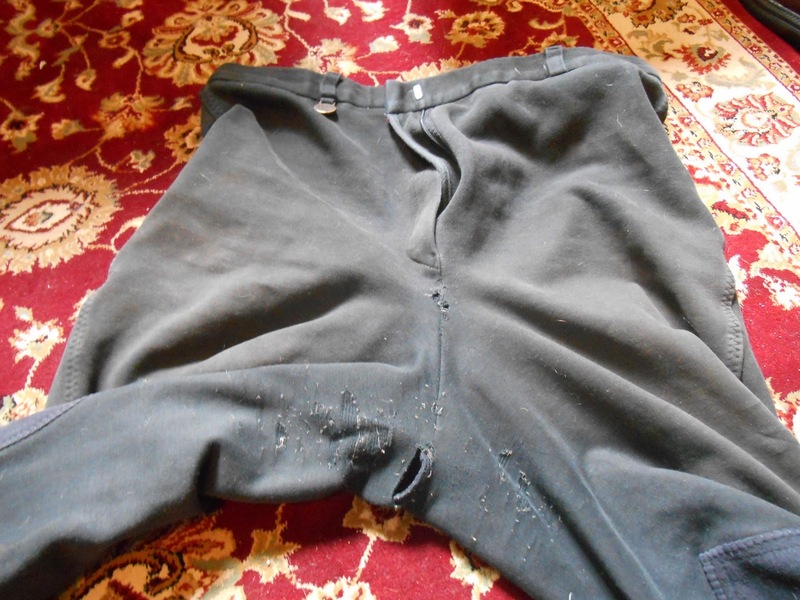 I have never had an issue with wearing things until they have holes – even the kerrits which seriously I had maybe 5 pair that I wore for every ride for over 15 years (holla at that spandex magic). I had a bigger issue with stains. Maybe a more technical material would last better. always sad to see a wardrobe staple bite the dust! When I can no longer respectfully repair them they get trashed. I'm with L. I will patch and mend to the best of my abilities. When it stops looking good, I give up and give to goodwill! Cotton naturals are way comfy and last forever! Always a sad day when you have to throw a pair out!